We held our seasonal bonfire celebration in the garden on the 13th November, having decided that all this digging, organising and back breaking work deserved a bit of reward. 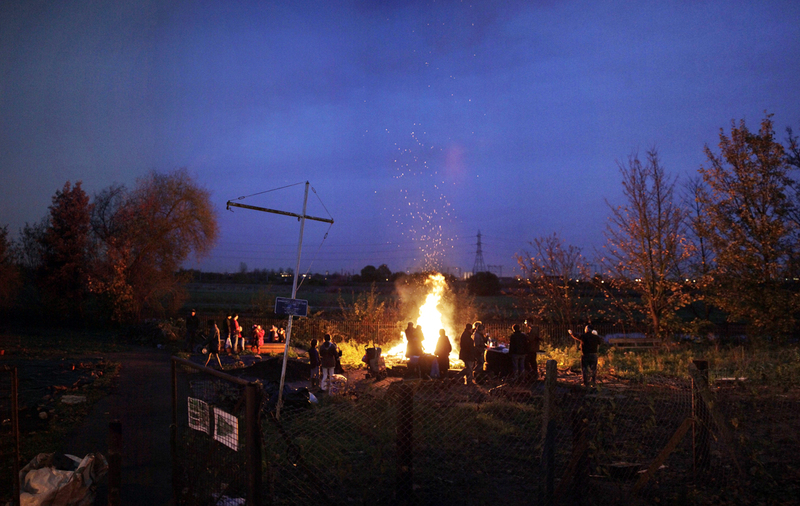 Also, we had alot of garden debris to tidy…puls a few keen firestarters amongst us …. I have to say it was the the bonfire of childhood dreams. A huge pile of wood had been gathering – thanks to everyones’ efforts and despite recent rain, the flames crackled and spiralled up into the magnificent sky over the marshes. We all raised a cup of mulled cider to our efforts and tucked into delicious home made soup, baked potatoes and pizza. The kids ran happily amok with toasted marshmallows and and treacle toffee. It seems as if this garden has already achieved so many of the aims of our constitution. Bringing the people of this unique community together, sharing ideas and making plans to transform our space for the benefit of all. More photos to follow . . . 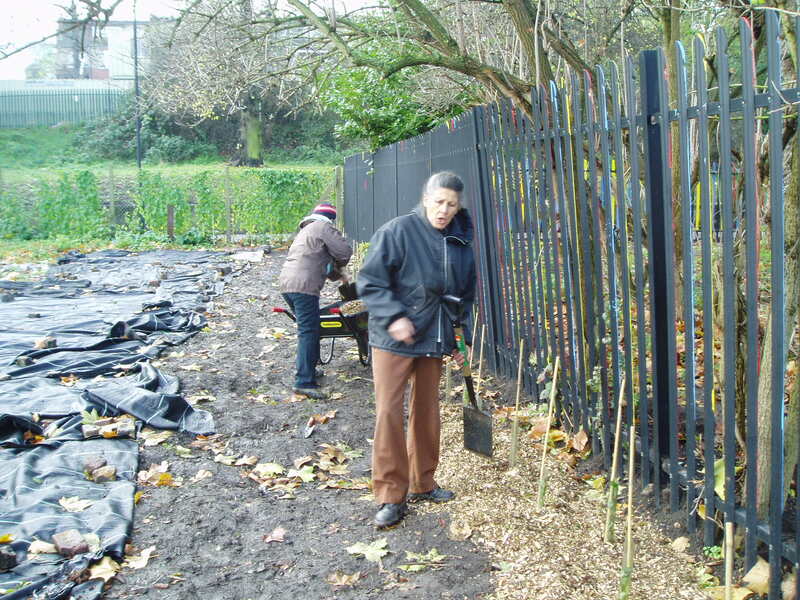 Thanks to everybody who came to the session last thurs, and helped put down a lovely thick blanket of bark chippings (provided by Hackney Parks) around the newly planted edible hedge. I think we did quite a professional job (see photo) and especial thanks to Lidka for the coffee and biscuits. 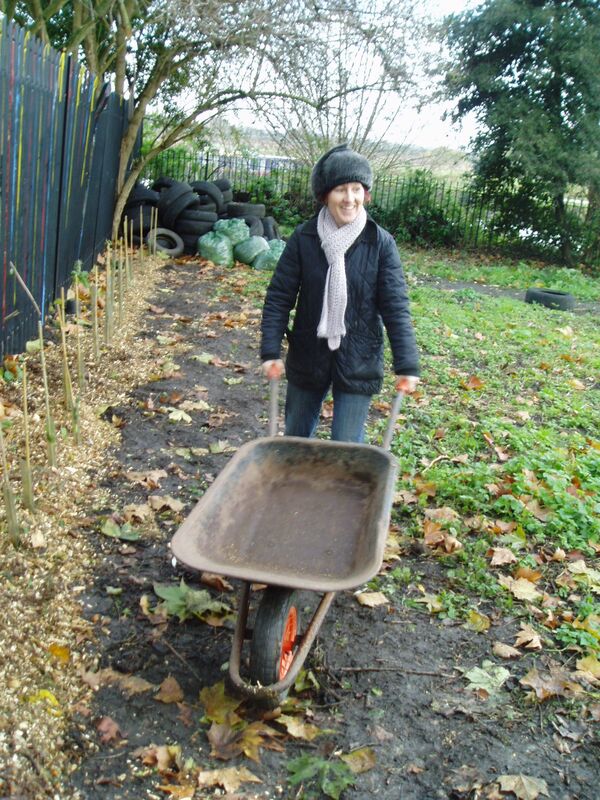 The trees were planted for us on Monday with great enthusiasm and skill by kids from Harrington Hill Primary School : we have Blackthorn, Elder, Dog Rose, Crab apple and Hazel, and are looking forward to the fruits of all our labours in a few years. First we wrapped each tiny tree in its own little tube to protect it from rabbits and other pests (I know it’s supposed to be an edible hedge but not quite yet) and added a bamboo stick to hold each one upright. 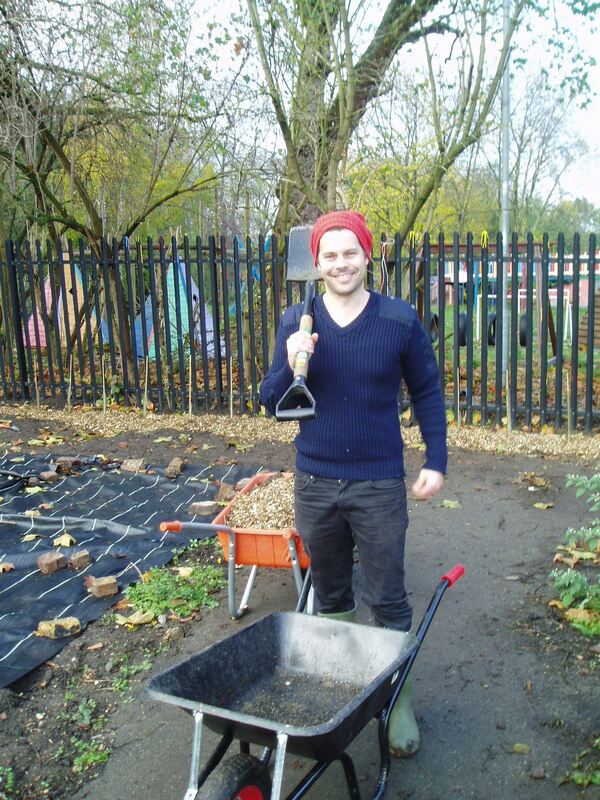 Then we trundled our wheelbarrows along to the mulch mountain that Hackney parks had delivered to just outside the gate, and spread it at the base of the hedge, where it will suppress weeds, retain moisture in the soil, and eventually as it breaks down, add nutrients and organic matter to the soil. It’s hardworking stuff, is mulch!